LOGEL industrial sectional doors are made of "sandwich" panel 40 mm thick, consisting of two outer layers of compressed galvanized steel panel with 0.5 mm thickness and an inner layer of thermal break polyurethane foam. The space between the panels is filled with a synthetic sealant. Industrial sectional doors are four-sealed and completely isolated and protected against the rain, dust, sand, insects, etc. All parts of the metal frame are made of high-quality galvanized steel to ensure long term durability and user friendly operation. 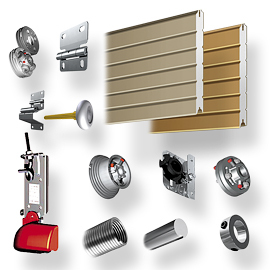 Guide rails for sectional doors with C-profile compile depending on the configuration of the door. Balancing torsion springs have a capacity of at least 25,000 cycles of opening / closing. Hinges for sectional doors are different types depending on the location of their installation and purpose to ensure a reliable connection between panels and securely fastening to the guide rails. Rollers are made of polyamide with high strength and provide longer life cycle and silent operation of the door. Industrial sectional doors are manufactured individually based on DLO (day light opening area). 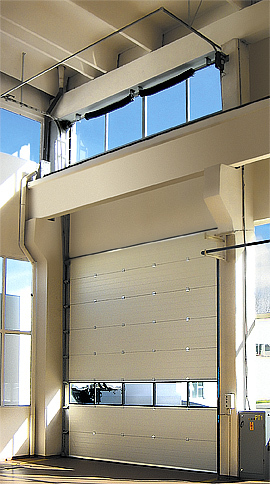 The various applications of the sectional door opening system ensure minimum space usage. Manual operation: Recommended for doors with a total area of up to 10 m2. The door is easily opened and closed by hand, because of the well balanced torsion springs, and it can be locked by key from inside as well. Automatic operation: Performed with different capacity of electric engines, depending on the size and loop of the door opening. All engines are equipped with emergency chain operation. The operation is controlled via a fixed control panel.